The main motto of the rally was to create awareness among the local residents , about the ill effect of the junk food , cold drinks and package foods which are used without viewing its content and other basic information by the rural people. The women also carried posters, placards and shouted slogan . people, specially breast feeding mother and pregnant women should eat good food and avoid different types of chips and cold drinks , they asked. 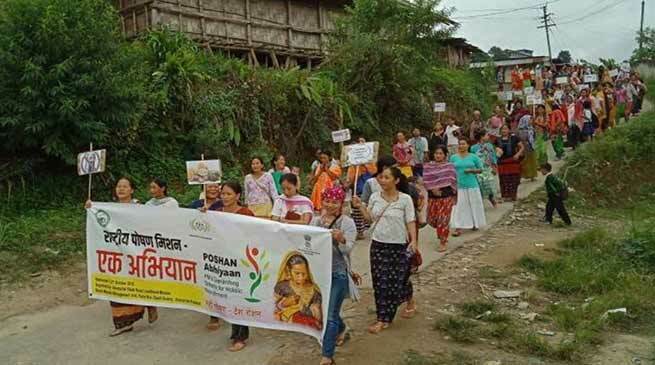 The rally went around the township and culminated at the office of the ASRLM where the officers of the department briefed several effect and preventive measure to remain healthy, fit and fine and also safety of the pregnant lady and breast feeding mother and child. Palin Block Mission Manager Gyamar Tata, Block MIS Anu Nalo, Cluster Coordinator Chi Doyi and Lerku Yudik among other address the gathering on the occasion.